These easy to make Tropical White Chocolate Candy Bites are the perfect thing to make and gift to someone who loves to indulge in a sweet little treat from time to time. With only four ingredients and about 10 minutes of time you can make these Tropical White Chocolate Candy Bites that will please just about anyone who sinks their teeth into these sweet, but not overly sugary, little treats. 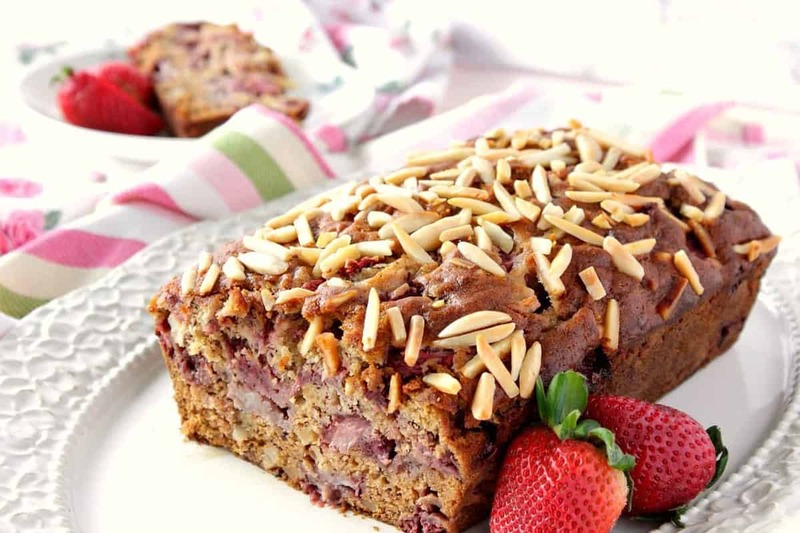 Think about making them for mom this Mother’s Day. 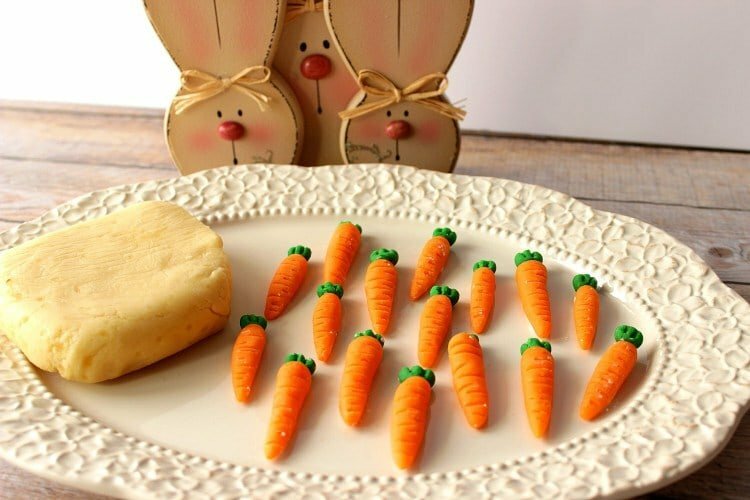 They’re so easy to make, even the kids can do it. Just make sure to pre-chop all the ingredients if the kiddos aren’t old enough to use a knife. One of my favorite things about going to a warehouse superstore is tasting all the free samples. Most of the time I’ll only taste products (sometimes going back for seconds), but I rarely ever purchase what I’ve sampled. However, the last time I was at Costco I tried some amazing coconut chips, and their taste blew me out of the water. I knew at that moment that I needed to purchase a bag, bring them home, and make something delicious with them. 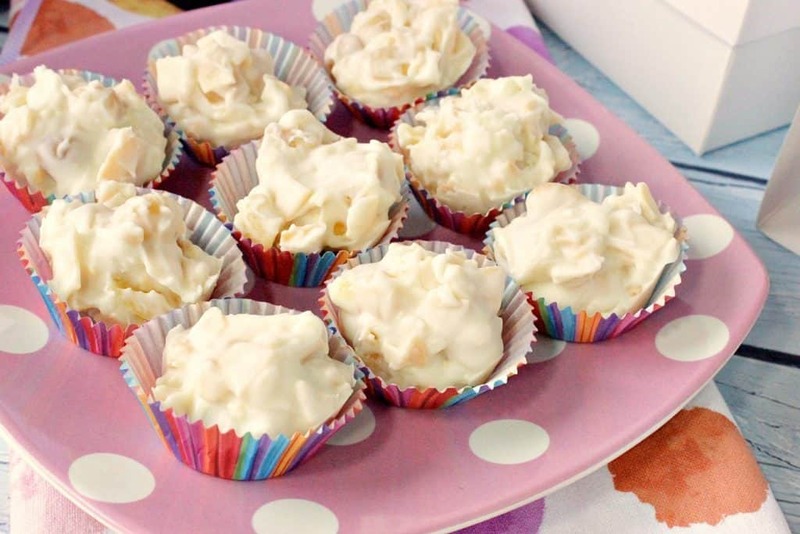 The results are these Easy To Make Tropical White Chocolate Candy Bites. 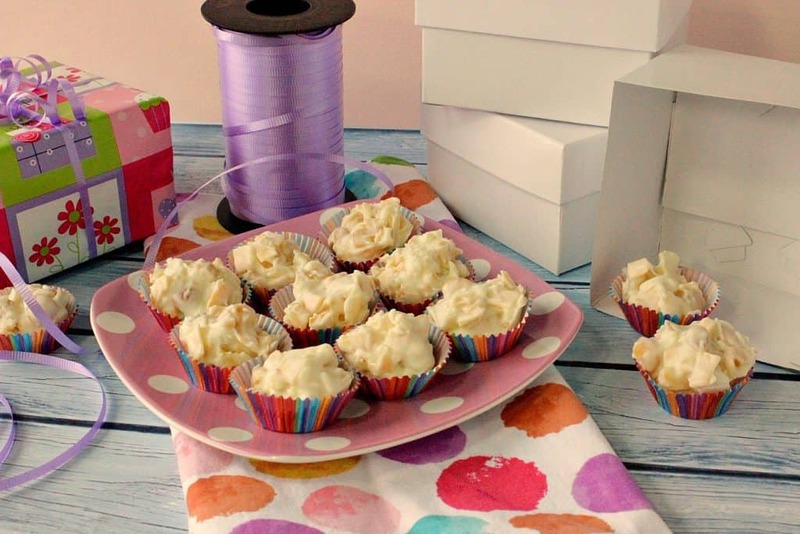 **Please Note – The printable recipe card with detailed instructions and complete ingredient measurements for making Tropical White Chocolate Candy Bites is available near the end of this post. Don’t get me wrong; I love a clean and organized kitchen as much as the next person does. It’s just that sometimes the (food) clutter I’m surrounded by is a delicious reminder of the good things that are soon to follow, and a lovely visual that I’ll soon be sharing my joy with the people I love! Below is a quick little video I made for you about how easy these Tropical White Chocolate Candy Bites are to make. If you enjoy this video, please subscribe to my Kudos Kitchen channel on Youtube. I made these Tropical White Chocolate Candy Bites for my mom’s birthday this year. When the time came to give her the boxes (yes, more than one because I gave her all 24 of the candies) I couldn’t have been happier because I knew I had packed these Tropical White Chocolate Candy Bites full of all the flavors she loves! For any of you out there who don’t enjoy white chocolate, macadamia nuts, dried pineapple, or coconut chips, please refer to this “recipe” as a “method” of candy making and not a hard a fast rule you have to stick to. Please feel free to substitute dark chocolate for white chocolate, cashews for macadamia nuts, raisins for dried pineapple, and even (call me crazy here) puffed rice cereal for the coconut chips. I’m not here to police what you make in your own home kitchen, but to inspire you to create with the flavors and products you love! After all, it’s just food. It’s supposed to be FUN! 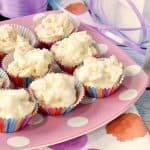 The following Amazon.com items are some suggested products I’ve chosen that will aid you in the making (and serving) of this recipe for Easy To Make Tropical White Chocolate Candy Bites if needed. By clicking on the item, you’ll be taken directly to Amazon.com if you’re interested in purchasing any of these products. You are in no way required to do so, and you will not be charged in any way unless you decide to purchase a product through Amazon. Time to think outside of the gift box (see what I did there? 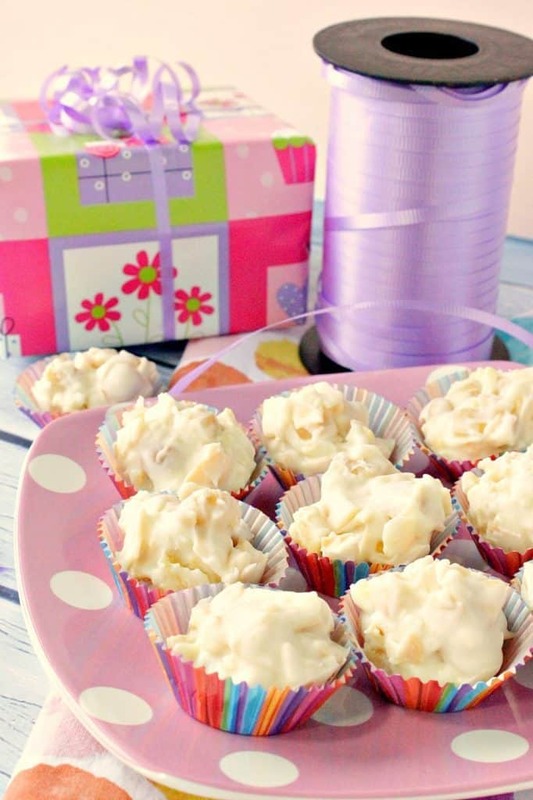 LOL) when it comes to reasons for making these Easy To Make Tropical White Chocolate Candy Bites…What about making these to serve at a bridal shower or wedding? You could do a tray of white chocolate and dark chocolate ones. You know, kind of like a bride and groom representation. Or, what about serving these for a girl’s night in, along with a nice glass or two of wine or Prosecco? Or, do as my mom did and served them to her bridge club the night she was hosting. 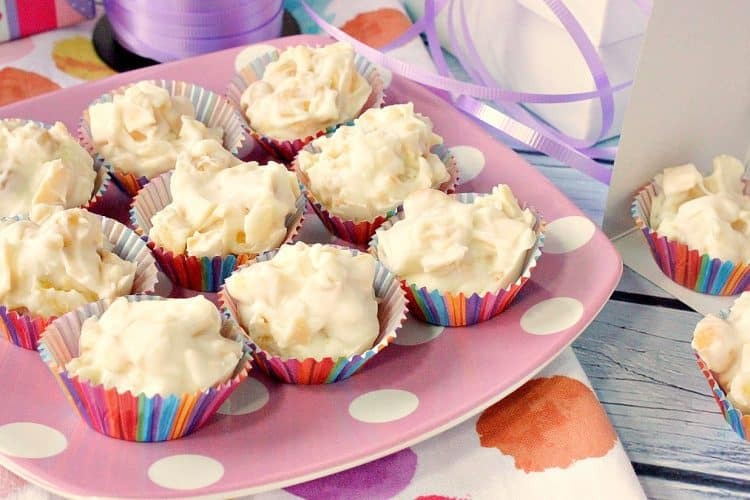 Whatever the occasion, these Tropical White Chocolate Candy Bites will fit in nicely! These easy to make Tropical White Chocolate Candy Bites are quick, no-bake four ingredient treat to give to someone who loves to indulge in a sweet little treat from time to time. Place the chocolate chips in a microwave safe bowl and microwave on 50% power, stirring occasionally until the chocolate is melted. 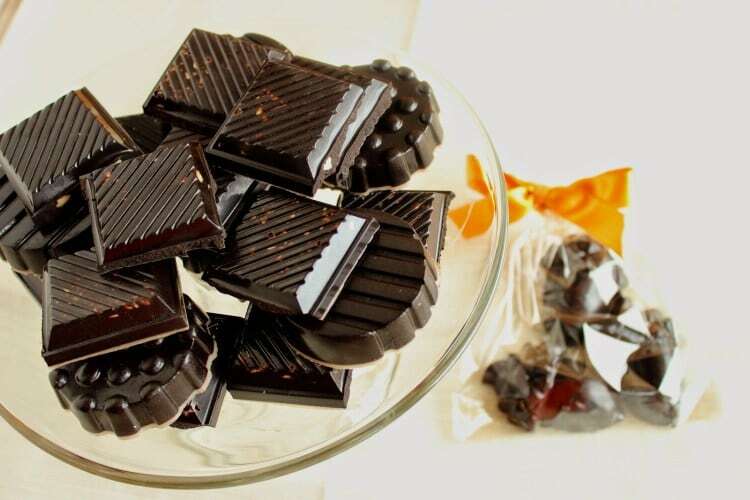 Place all the ingredients (including the melted chocolate) in a large bowl and stir well to combine. Spray mini muffin tins with baking spray. Fill each mini muffin tin with the candy mixture. Freeze at least 15 minutes. Fill the mini muffin cups with the frozen chocolate candy. Box and gift if desired. I hope this recipe is one that you’ve enjoyed and that you will consider making for yourself (or someone you love), soon. 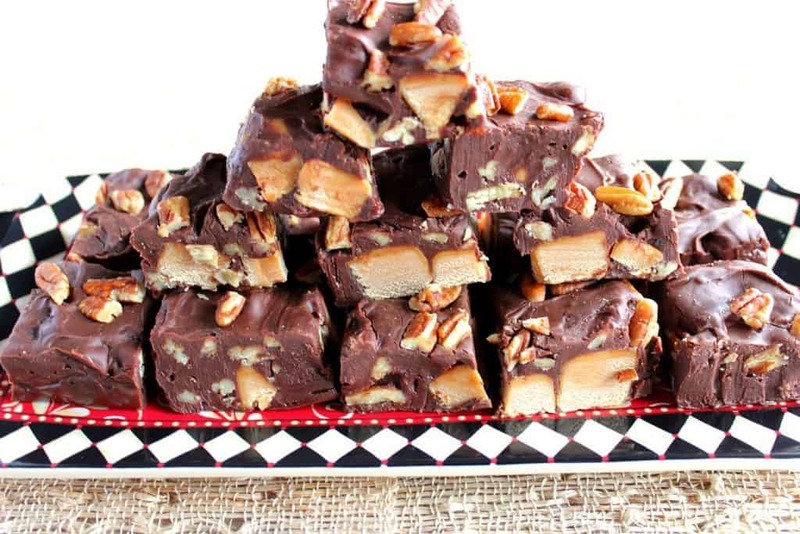 If you’re hungry for other easy candy recipes to gift and enjoy, please check out some of my additional candy recipes. You’re going to love them too! I hope you’ve enjoyed today’s recipe for Tropical White Chocolate Candy Bites as much as I’ve enjoyed bringing them to you! 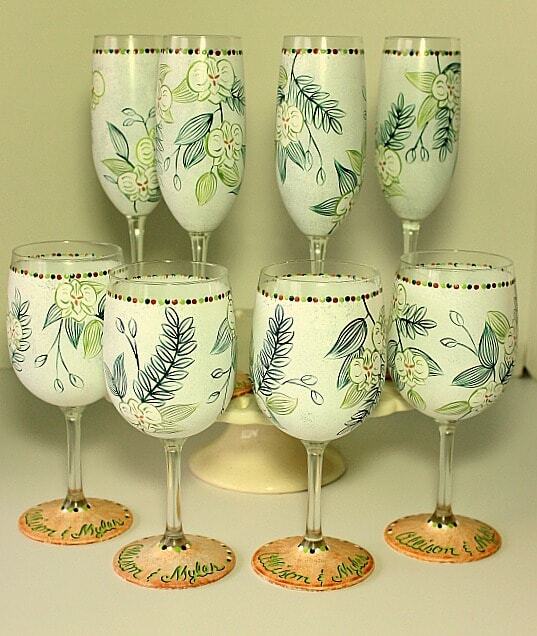 I’ve decided to coordinate this recipe for Tropical White Chocolate Candy Bites with these Hawaiian themed wedding glassware items I painted for a customer’s destination wedding a few years ago. The design I painted was from a copy of the wedding invitation the couple had sent to me. And, as you can see each glass is personalized with the bride and groom’s names on the base. Talk about a wonderful keepsake! Should you have any questions regarding this recipe for Tropical White Chocolate Candy Bites, or anything else you’ve seen on my site, please don’t hesitate to contact me directly, or leave me a comment in the comment section below. It is always my distinct pleasure to get back to you with a reply just as soon as I possibly can! *The post above includes affiliate links. When I find a great product or service, I like to share it with my readers. Sometimes I use affiliate links so I can earn a commission for my recommendations. As always, I thank you for your support! Now I need to go make some Candy! These look delicious! Oh my, these look absolutely fantastic!! Oh wow!! These are terrific!! I need to make some asap! You can’t beat candies that come together so easily! 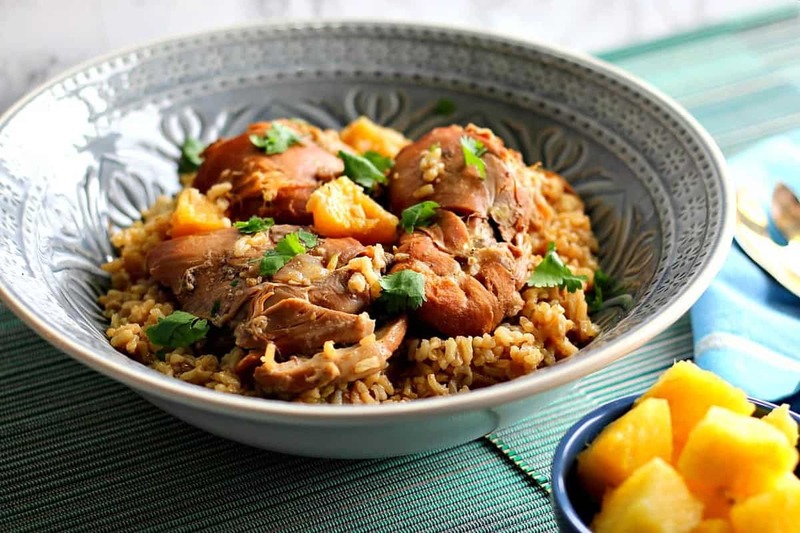 Plus, I love that you could easily switch up the flavors with different mix-ins. I love these little bites! This would be fantastic for my friend’s tropical themed bridal shower! They would be PERFECT for that! If you do it, I hope they’re a hit! These flavors have been heavy on my mind lately-going to have to try this!